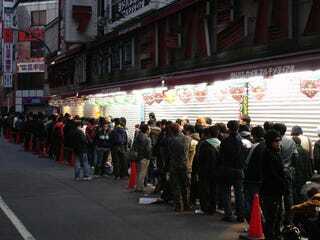 How Hard Will It Be To Get A PS3 Slim In Japan At Launch? Who knows! That didn't stop me from calling five Japanese retailers to find out. Game retailers in Japan run the gamut of small, independent Mom 'n' Pop style shops to the larger, nationwide chains. Since the chains get larger product shipments, I called five shops in Osaka and Tokyo. I called one in Kyoto, but no one answered. Sorry Kyoto! According to the staffer I spoke with there, the store is still taking pre-orders for the PS3 Slim. Those interested in pre-order must pay ¥2,000 (US$21.50) upfront for a reserve. The staffer did not know how many consoles it would be getting. Likewise, still taking pre-orders. The staffer said he hoped they would be able to fill all their pre-orders. While the staffer did not know how many consoles they will be getting, it did say, "We won't be getting a ton of them." Sony held its official PS3 launch at the Yurakucho branch. Bic Camera isn't asking for money upfront for the reserve and is still taking pre-orders. As with the other shops, this branch does not know how many units it will be getting. As with all the other shops, this branch is still taking pre-orders. The staffer, however, recommended that I line-up before 9:30 if I don't pre-order my PS3 Slim. This branch will have consoles for those who don't pre-order, but it's possible they could sell out quickly, the staffer said. Ditto for still taking pre-orders. The staffer didn't know how many PS3 Slim consoles the shop would be receiving. In the most recently released Japanese hardware sales figures, Sony sold only 2,052 PlayStation 3s compared with 8,979 Xbox 360s and 26,972 Wiis. The reason of course for the abnormally low sales figures is because new PS3 consoles were not sold, leaving some areas in sort supply or even with PS3 sell-outs. Expect a huge spike in sales when the PS3 Slim launches in Japan.